A thigh strain or quadriceps strain is a tear in one of the quadriceps muscles at the front of the thigh. It can range from mild discomfort to a full-blown tear of most of the muscle, resulting in severe pain and inability to walk. Treatment includes rest and ice in the acute stage followed by stretching and strengthening rehabilitation exercises. Grade 1 symptoms of a grade 1 quadriceps strain are not always serious enough to stop training at the time of injury. A twinge may be felt in the thigh and a general feeling of tightness. The athlete may feel mild discomfort on walking and running might be difficult. There is unlikely to be swelling. A lump or area of spasm at the site of injury may be felt. Grade 2 symptoms are more severe than a grade two. The athlete may feel a sudden sharp pain when running, jumping or kicking and be unable to play on. Pain will make walking difficult and swelling or mild bruising would be noticed. The pain would be felt when pressing in on the suspected location of the quad muscle tear. Straightening the knee against resistance is likely to cause pain and the injured athlete will be unable to fully bend the knee. Grade 3 symptoms consist of a severe, sudden pain in the front of the thigh. The patient will be unable to walk without the aid of crutches. Bad swelling will appear immediately and significant bruising within 24 hours. A static muscle contraction will be painful and is likely to produce a bulge in the muscle. The patient can expect to be out of competition for 6 to 12 weeks. Thigh strain assessment should include questions concerning the patient’s general health, previous injuries, and current injury. The aim of these questions is to determine what may be causing the pain and what treatment is appropriate. The therapist will then perform a physical assessment of the injury which will include observation and palpation, range of motion tests and resisted muscle tests. Tears of the quadriceps muscles usually occur following an activity such as sprinting, jumping or kicking, especially if a thorough warm-up hasn’t been undertaken. 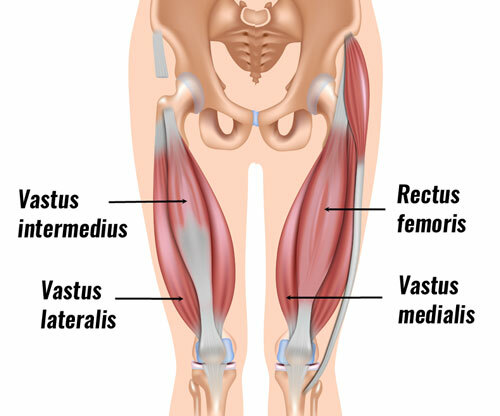 Any of these muscles can strain or tear but probably the most common is the rectus femoris. This is because it is the only one of the four muscles which cross both the hip and knee joints which makes it more susceptible to injury. 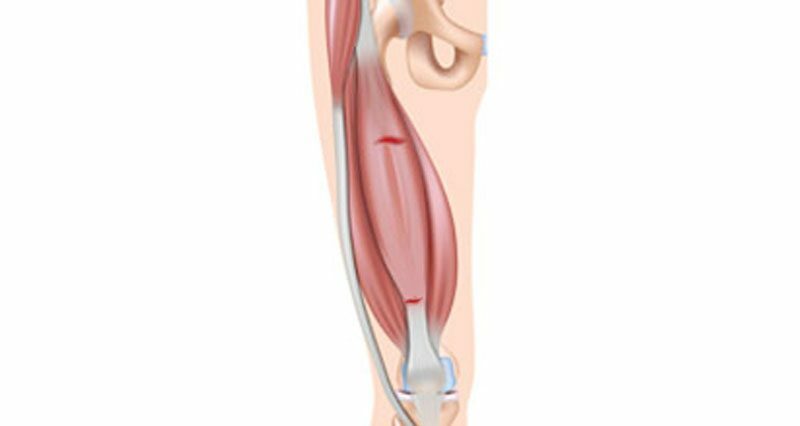 A strain can occur either at the musculotendinous junction where the muscle becomes tendon just above the knee, or higher up in the belly of the muscle nearer the hip (known as a ‘bulls-eye’ lesion). Injury to the rectus femoris tendon at the hip either as a tear or an overuse inflammation type injury can also occur. Injuries that occur following a direct impact on the muscle, such as being hit by a ball or other hard object, are more likely to be contusions and should be treated slightly differently. For information only. We recommend seeking professional advice before beginning and rehabilitation program. Initial treatment for a thigh strain should be to apply the PRICE principles of protection, rest, ice, compression, and elevation. Protect the injured muscle by wearing a thigh support or compression bandage. Rest from all sporting activities in the early stages of healing. Continuing to train on an injured muscle will prevent it from healing properly. Elevation of the injured limb should also be done in the early stages and this is best achieved by lying on a sofa with the leg resting up on 2 pillows. Ice – apply ice or better still a cold therapy and compression wrap for the first 72 hours after injury. Apply ice for 10 minutes every hour initially reducing the frequency as symptoms improve. This will help stop internal bleeding and swelling and hopefully limit the extent of the injury. After the initial acute stage treatment will depend on the severity of the injury. Compression will help reduce swelling and protect the area. Elevate the injured leg to help swelling and tissue fluids flow away from the site of the muscles strain. A professional therapist can make an accurate diagnosis and advise on a full treatment and rehabilitation program. They may use electrotherapy such as ultrasound to aid the healing process. Sports massage may be beneficial after the initial acute stage has passed as it helps to increase blood flow to the muscles which aids the healing process. Muscle flexibility may be improved which is often decreased following a tear in the muscle. Massage is also thought to realign scar tissue and improve tissue elasticity. Below is an example of thigh strain or quadriceps rehabilitation programs depending on whether the injury is a grade 1,2 or 3. The following guidelines are for information purposes only. We recommend seeking professional advice before starting any rehabilitation. Rest and apply cold therapy to the thigh as soon as possible for 15 minutes at a time. Repeat this every 2-3 hours. Do not apply ice directly to the skin or you could get ice burns. Wear a compression support all the time to help reduce swelling. Stage 2 – Days 2-5: If pain-free, start to stretch the quad muscles gently. After 48 hours, sports massage can be applied very gently to start with and see how the injury responds afterwards and the following day. Start to strengthen the muscle again, gently to start with and only if this is completely pain free. Stage 3 – Days 6 onwards: Continue with stretching, strengthening and sports massage. Return to training when you have no pain on any of the exercises, or day-to-day activities. Start off very gently and gradually increase running speed, and intensity of other activities such as kicking and changing direction. Stage 2 – Days 5-12: Return to full weight bearing if you haven’t already. Start to gently stretch the quad muscles, provided it is comfortable to do so. Hold stretches for 20-30 seconds and repeat three times. Do this 3-5 times a day. Sports massage can be used from day 4 onwards. Once it is comfortable to do so, start gentle strengthening exercises. Stage 3 – Days 13-21: Continue with sports massage and stretching exercises. Gradually increase the intensity of strengthening exercises. Start to introduce activities such as cycling and gentle jogging. Apply heat if the muscle feels stiff – 15 minutes at a time before activity. Return to gentle training once all day-to-day and above exercises are pain-free and you have range of motion equal to the other side. Immediate treatment – Days 1-7: Seek medical attention immediately. Apply cold therapy for 15 minutes at a time, every 2-3 hours for the first 48 hours. Use crutches. Use a compression bandage and rest with the leg elevated. Stage 2 – Days 8-14: Generally with an injury this severe, all treatment should be directed by a sports injury professional and should include stretching exercises, sports massage (after the acute phase has passed). Ultrasound may be used and gentle strengthening exercises can begin for example static or isometric contractions. Stage 3 – Weeks 3-6: Strengthening exercises are the main feature of this stage of treatment. Increase the difficulty and intensity of exercises as pain allows. Continue with stretching exercises. Continue with sports massage. Wear a thigh support or heat retainer to support the leg and improve blood supply. Use heat before exercises. After the initial acute stage of the injury has passed, a gradual rehabilitation program consisting of stretching and strengthening exercises should begin. Stretching exercises should always be pain-free starting with gentle static stretches and progress through to more sports specific stretches performed dynamically (with movement). Do not start stretching too early as the healing of the muscle may be compromised (not before day 5 post-injury). The initial active range of motion exercises is done where the knee is bent through as full a range as possible. A simple static quadriceps stretch is done when pain allows. Strengthening exercises – the aim of strengthening exercises is to gradually increase the load that is put through a muscle. Strengthening exercises can start as early as day 5 as long as they are low-level and must be done pain-free. If it hurts do not do it! Isometric or static exercises are advised first and then progress to dynamic exercises with resistance band and finishing with sports specific running and sprint drills. Eventually, more sports specific or functional strengthening exercises are done involving sprinting, change of direction and plyometric or hopping type exercises. Read more on strengthening exercises.